In May, Octavio Cruz and I joined Georgia Strait Alliance’s Species Protection Outreach Team as summer students. Our goal was to organize local events to educate community members about threats to the Strait of Georgia and, specifically, to British Columbia’s beloved Southern Resident killer whales (SRKWs), while encouraging them to take action to ensure the survival of these animals. 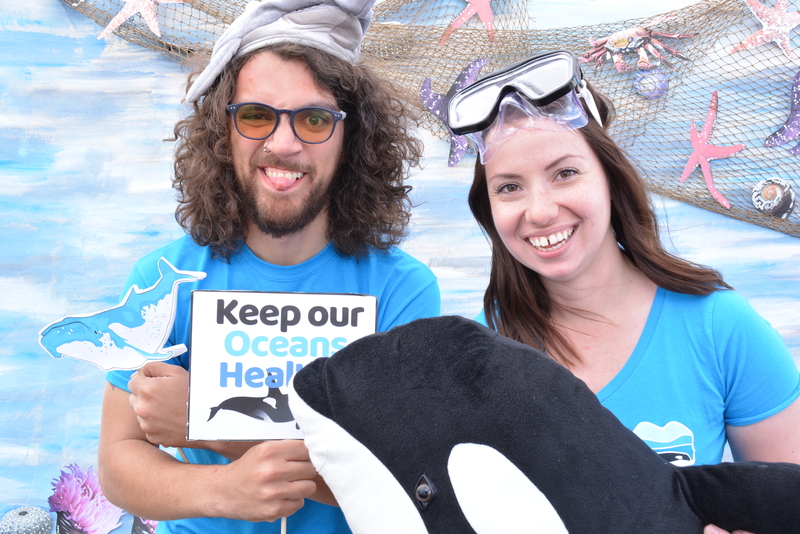 From travelling around Vancouver Island to learn about fish farms to encouraging orca lovers to express their passion through tattoos, this summer was all about connecting with people and inspiring creative yet impactful actions. Things got real very quickly. We were fewer than two weeks in when the federal government announced its intent to purchase Kinder Morgan’s Trans Mountain Pipeline for $4.5 billion. As the summer continued, two Southern Resident killer whales (L-92 or Crewser, and J-35 or Tahlequah’s calf) were lost, and there were significant provincial government decisions on fish farms, making this summer tumultuous and, at times, even disheartening. The provincial decision to introduce new rules for fish farm leases in 2022 was a significant step towards reconciliation with First Nations and protecting wild salmon, but the four-year timeline was disappointing. Countering that disappointment, however, was seeing and interacting with people whose relentless passion, hope, and love for the Georgia Strait and its inhabitants was inspiring—and unforgettable! Our first work event of the summer was the Festival of Ocean Films in Victoria, hosted by Georgia Strait Alliance. The documentaries Sea of Life and The Hundred-Year-Old Whale were followed by interviews with the films’ directors—and the theatre was sold-out! 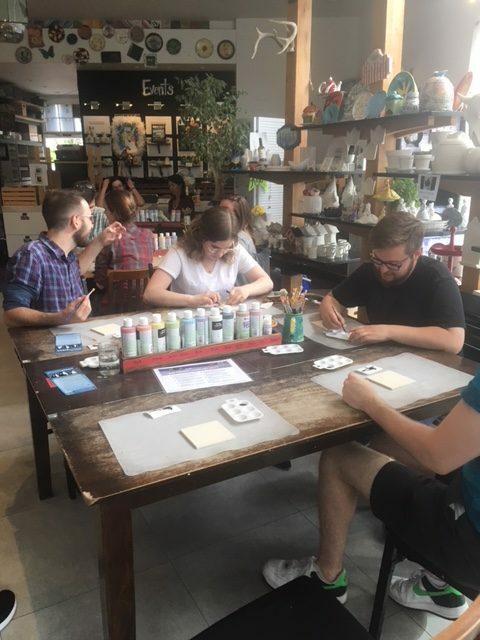 In June, we attended World Oceans Day events in Victoria and Vancouver, fish farm rallies and meetings in Langford and Nanaimo, and Octavio and I organized our first summer student event: an evening of pottery painting at Fired Up! Victoria. These events afforded us opportunities to talk with the public about the impacts that fish farms have on wild fish populations and, consequently, on Southern Resident killer whales. Talking with passionate and concerned community members, who were curious about making real changes, about the state of their local environment and was fantastic. This passion for protecting the Georgia Strait persisted throughout the summer at other events and it continues on now. In July, the Species Protection Outreach Team expanded our Victoria footprint by partnering with Friends of Uplands Park to create Tide Pool School, an event designed to educate beachgoers on how to respectfully interact with and observe marine species found in the intertidal area. We also attended local markets, held an event at a local brewery, and travelled on the support boat as Rama DelaRosa launched her six-day, 86km open-water swim around Salt Spring Island. It’s been wonderful to see a community of GSA supporters forming in Victoria, with families and friends attending multiple events, asking about opportunities to get more involved, and spreading the word about this fabulous organization and marine news. The end of July, however, was marred by the start of J-35’s (Tahlequah) 17-day tour of grief over the death of her calf. Her actions permeated the news and events throughout August, matched only by concerns about the young J-50’s (Scarlet) deteriorating state and efforts by NOAA, the Center for Whale Research, Vancouver Aquarium and others, to help her. In our final week of work, the Species Protection Outreach Team, volunteers, and around 70 community members came together to hold a vigil in Victoria for Tahlequah and her calf. Only days later, it seemed as if the passion, grief, work, anger, love, and support we had seen over the summer was finally rewarded when the Federal Court of Appeals quashed the federal government’s approval to build the Trans Mountain expansion project! The fight continues, however, as Georgia Strait Alliance and several other conservation groups recently launched a lawsuit to force the Minister of Fisheries and Oceans and the Minister of Environment and Climate Change to take immediate action to protect and recover the Southern Resident killer whales. Despite the Ministers acknowledging that Southern Resident killer whales face “imminent threats to their survival”, they have opted not to recommend an emergency order to protect the orcas, even though it’s a legal requirement under the Species at Risk Act. As I turn the page on this summer, I’m happy that I had the opportunity to work closely with others who are passionate about orcas and other marine species, interact with and educate the public about local environmental concerns, and was able to see first-hand the real impacts that communities can have to advocate for the continual protection of the marine environment.